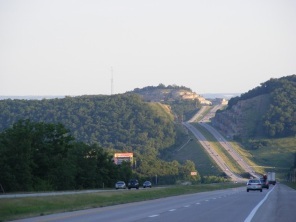 The KC to Branson road trip is a comfortable 4 hour trip from the south part of Kansas City. That time will vary, of course, based on the number of stops that are made, but 4 hours still allows time for fueling and a quick stop. We are re-setting the trip odometer to 0.0 at the Blue Ridge Parkway exit on Hwy 71 in Grandview, just south of Kansas City. We are taking Hwy 71 to Harrisonville then Hwy 7 to Clinton and from there Hwy 13 to Springfield. This is the quickest and shortest way from KC to Branson. At Springfield, a quick jog on I-44 to Hwy 65 will take you to Branson. From the road trip's starting point at the Blue Ridge exit it is 4-lane divided all the way to Branson, but these are not Interstates so there are side roads coming into the highways and some stoplights. Remember our mileages do not include any stops so you will have to adjust for whatever stops you make. You should also remember that cars may read mileages a little different depending on various factors. 14.3 miles--Exit ramp to Peculiar, MO. There is a "Flying J" Truck Stop at this exit. Flying J is a good stop for cars and RV's and has a Denny's restaurant. "Flying J" Truck Stops are usually clean and have competitive fuel prices. Although Springfield has a history of comparatively low fuel prices, recently there have been times when Kansas City has been cheaper. It is doubtful that you will find anything cheaper between here and Springfield. 21.2 miles--This is the first exit of Harrisonville, MO and there are motels, shopping and restaurants at this exit. 30.8 miles--on your right is Kurzweil's meat market and store. This is a wonderful place to get a sandwich. They'll slice the meat you want and make it to go or they have tables and chairs. They have a full market of meats, sauces and condiments plus a lot more. If you plan to keep a cooler of food on your trip or have a stocked cooler in Branson, you'll want to make this stop. 34.0 miles--Garden City exit. The Phillips 66 "Seven Stop" C-store is a good stop with friendly people and some unusual items in the store and next door. Ice Cream cones, jams, jellies and sauces are available. Note-It hasn't been too many years ago that a KC to Branson road trip would take quite a bit longer. This was all a 2-lane highway that went through the centers of the small towns like Garden City, Creighton and Urich. There was a lot of traffic and curves and many accidents along this stretch. Hwy 7 was one of the first parts of the road to be divided. 43.1 miles--Creighton exit. A Conoco station and the Farmhouse Restaurant are at this exit. The Farmhouse restaurant has a solid reputation as a place for good country cooking. 62.5 miles--Stoplight at Clinton, MO. This is where you pick up Hwy 13. There is a hospital on the Northeast corner of the intersection. Continue straight on Hwy 13. On your right, past the intersection is Everhart's Hunting and Fishing store. You are close to the Truman Lake area and further east is the Lake of the Ozarks. 64.9 miles--Stoplight. Hwy 7 exits your path and goes east to Truman Lake, Harry S. Truman State Park and the town of Warsaw. Further east is Lake of the Ozarks. If your road trip to Branson began further away than Kansas City, this is a nice little town to spend the evening. 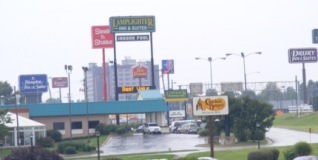 A variety of restaurants are located here including Applebee's and Golden Corral. Several local restaurants are also in the area and in the historic downtown area. The "M" Motel which was on the east side right before the stoplight and the Parkfield Inn and Hampton Inn on the west side just past the stoplight are some of the lodging in the area. Your KC to Branson road trip is now on Hwy 13 and the next few miles will take you along two bridges over Truman Lake. This is the western edge of the lake but a favorite fishing spot for many. 81.5 miles--Lowry City, MO, where the plains meet the Ozarks as the road sign says. Your KC to Branson trip is now getting into Ozark Mountain Country and you will start to see a gradual change in the terrain. There are two nice C-store stops here. On the right is the Alexander Farms C-store. Inside is a nice clean store with friendly people offering the normal C-store merchandise plus a BBQ cafe and a log cabin style decor. Bathrooms are immaculate and for road trippers that is a reason to stop. We hope they stay that way. Across and down the road is the Shelby Conoco C-store and Truck Stop. You can find an A&W and Long John Silver counter here. Oxyoke Bar-B-Que is on the right side of the highway. 86.5 miles--Osceola, MO. On your left (east) is the Amish Country Store "Moccasin Trails Antiques." This is an interesting store and we found some items that brought back memories, even buying some. It's worth a stop. To the north of it is a little hut called the "On the MOO-ve Burger Barn." We haven't had the chance to eat there but the cow motif is a draw. Just south of there is the Osceola Cheese Store, a favorite stop traveling from KC to Branson and famous for the seemingly endless variations of cheese and the sampling cups of each one. Soft drinks, sausage and snacks are also available. This is a stop you want to make. Next door is a gift shop called "Ewes in the Country." Across the road is Joe's Market full of more treats and sandwiches. A short way south and down the hill on Hwy 13 you will cross Truman Lake again. This is the last arm of the lake to pass under Hwy 13. On the right is a hospital and down the road is the town of Osceola. 100.2 miles--Collins, MO. Last year this became the last 4-lane section completed. We hate to see that last 2-lane section gone. The 4-lanes are safer and faster but there is a character on those old roads that is missing on the new ones. Collins was a favorite stop for travelers going from KC to Branson. 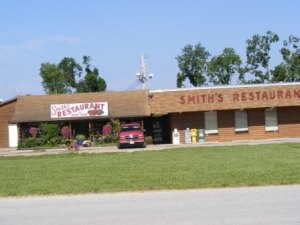 Smith's Restaurant and Peggy's Restaurant are great stops for breakfast, lunch or dinner. Smith's has some great pies and some of the best catfish around. Both are still open so just take the Collins exit and go east under the highway. Note-Pomme De Terre Lake is east of Hwy 13. Take Hwy 54, 19.5 miles east to Hermitage then south on Hwy 254 3.1 miles and turn right for 0.3 miles to Dam-site camp area. To get to Pomme De Terre State Park, instead of turning right to stay on Hwy 254, continue straight on the road which becomes Hwy 64 for 1.5 miles and turn right on CR-246 to get to the park. 123.1 miles--Bolivar, MO Hwy 32. Kum & Go C-store is at this exit. Going east on Hwy 32 across Hwy will take you towards downtown Bolivar. A hospital is also located in this area. Note-West on Hwy 32 will take you to Stockton and the Stockton lake area. Follow Hwy 32 west to Stockton for 22.6 miles, turn left (south) on Hwy 39 for 3.6 miles to Hwy 215, turn left (east) and follow across bridge 4.8 miles to Stockton state Park. There are several campgrounds on Stockton Lake so you can stop in Stockton to find information and directions to these places. 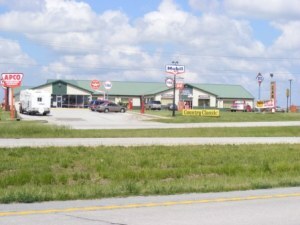 You will pass 3 motels, the Country Inn, Comfort Inn and Super 8 which can be accessed at the next exit south of Hwy 32. 126.8 miles--Bolivar Hwy 83. Hwy 83 takes you to downtown Bolivar. Wal-Mart and other shopping at this exit. 128.6 miles--along the short stretch to the next junction you will find several intriguing antique stores. On the west side is Karlin Lane Antiques and Country Classics Antique Mall featuring old gas station signs and classic cars. These can be accessed at the junction of highway U/Y. You will also see a Phillips 66 C-Store and a Smith's Restaurant. These are the same people that have the Smith's Restaurant in Collins. The restaurant has an interesting antique décor. 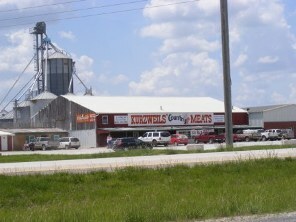 On the east side of the highway is Pappy's Antiques in the big red barn. 148.9 miles--Stoplight at Hwy O. Conoco C-store on east side. 151.5 miles--Farm Road 94 to the west will lead you to Fantastic Caverns, America's only ride thru cave. If you have the time, you'll want to see this attraction. The cave grounds are in a beautiful setting and features a beautiful gift shop and waiting area. Tours are about every 30 minutes. Turn right (west) onto Farm Road 94 for 1.9 miles and turn right (north) on Farm Road 125 and follow for 1.3 miles to the caverns. 153.3 miles--Norton Road, Springfield. On your right are 2 Kum & Go C-stores and behind them is a large Lowe's Store. If you go left (east) on Norton Road a short ways you will be at the entrance to Springfield's Dickerson Park Zoo and next to it is the Ozark Empire Fair Grounds. This is a top notch zoo for the size of Springfield and well worth a visit. The Ozark Empire Fair is a major regional fair and usually operates from the last part of July through the first week or 10 days of August. There is a speedway and other attractions occurring through the rest of the year. From here you have some options, but we will focus on the shortest and quickest route to Branson. Note--Springfield is an interesting city to visit and since the KC to Branson trip is relatively short, you may want to spend some time here. Springfield is also a great city to stay overnight and has most of the major motel/hotel chains plus many locally owned and unique motels located throughout the city. Of note is the Rail Haven Motel which was one of the popular Route 66 motels of years gone by. It has been kept well and remodeled and has theme rooms that are a fun change from the normal room. Located on the southwest corner of Glenstone and St. Louis Streets, this is a favorite of the Route 66 roadies. Glenstone can be accessed off I-44 and is the next exit on our roadtrip. Some of the activities in Springfield such as the Springfield Cardinals and the original and largest Bass Pro Shop will be mentioned at other exit points. Let's get back to Hwy 13 at Norton Road. 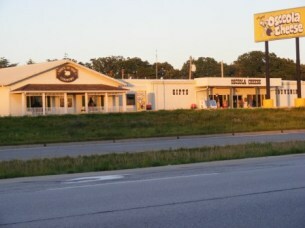 Hwy 13 becomes Kansas Expressway in the city and you'll see shopping centers and restaurants all along the road. You will now go through a new style of interstate exit intersections called the diverging diamond where traffic changes sides allowing traffic to get off and on the interstate more efficiently. You may have to think about why this would work but having set in traffic jams here for many years, we'll leave it to the engineering minds to figure out and just accept the obvious. It works. 153.5 miles--Turn left onto the exit ramp going east on I-44. 156.3 miles--Exit 80A Glenstone Ave. If you plan on staying or eating in Springfield, this is a good stop. There are lots of choices for motels and restaurants. Motels include Drury Inn, Hampton Inn, Coach House Inn, Comfort Inn, LaQuinta, Holiday Inn, DoubleTree Hotel plus many nice local motels. Approximately 3 miles south on Glenstone takes you to the Rail Haven motel that was mentioned earlier. Restaurants include Cracker Barrel, Steak & Shake, Ruby Tuesday, Houlihans, Bob Evans and a host of local eateries. 161.1 miles--Chestnut Expressway takes you west into downtown Springfield and Hammons Field, home of the St. Louis Cardinals Double A affiliate Springfield Cardinals. This road is also a good access to Missouri State University, Drury University and Evangel University. 163.2 miles--Sunshine St. Take Sunshine west 3.9 miles to Campbell St, turn left and you're at the original and largest Bass Pro Shops Outdoor World. You could spend hours in this store filled with sporting equipment, boats, clothing, home décor, paintings, activities, restaurants, waterfalls and more. This is one of the most visited destinations in the state of Missouri. 164.7 miles--Battlefield Road. Motels, restaurants and retail highlight this exit. If you go further into town on this road you will find even more lodging, dining and retail opportunities including Battlefield Mall. 167.0 miles--The Cloverleaf. This is the intersection where Hwy 60 and Hwy 65 cross. The cloverleaf is being upgraded to handle the traffic so there is a lot of construction going on here.Completion is due in 2012. Taking 60 east a short ways takes you to the Missouri Sports Hall of Fame. The town of Rogersville is a little further and ultimately the route will meet with Hwy 63 and take you to Memphis. The exit ramp sign says Hwy 60 Cabool. Staying on Hwy 65 will take you over Lake Springfield towards Ozark and Branson. Note- Hwy 65 from Springfield to Branson is a wonderful scenic drive through the Missouri Ozark Mountains. Some say that these aren't really mountains but just deep valleys and that may be true. The elevation at the top of most of these mountains is not as high as the city of Springfield which sits on a plateau. Nonetheless, it is a beautiful drive. This was rugged hill country with few straight roads as late as the 1950's. Before the advanced road building technology, roadbeds were laid primarily for ease and cost resulting in hilly, curvy roads throughout the Ozarks and those road are still dominant once you get off the main highways. 171.0 miles--Hwy CC, Fremont Hills exit. If you're anywhere near being hungry, you've got to make this stop. 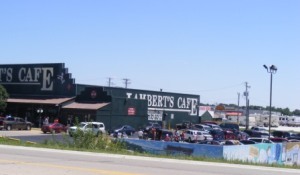 Lambert's Café, "Home of the Throwed Rolls" is on the east side of the exit. Good food, unique atmosphere and very friendly people and yes they throw you the rolls whenever you need them. There can be a line to get in but it is an enjoyable wait and they are pretty efficient. 174.2 miles--Hwy 14, Downtown Ozark exit. This is a good stop with motels, restaurants, shopping and a short drive into Historic downtown Ozark. A Fast n' Friendly ConocoPhillips C-store and a Casey's are good stops to make for fuel if you need it and they usually match the low gas price in the area. Behind the C-stores are several antique and flea Market stores and an RV Park. West on Hwy 14 will take you to Nixa, MO. 175.7 miles--Hwy F, Sparta exit. A Shopping area is at this exit with a WalMart Supercenter, shops and fast food restaurants. 179.0 miles--Hwy EE Highlandville exit. Hwy EE takes you west to Hwy 160 which is the alternate route to Branson and the lake area. At one time Hwy 65 followed this route through Highlandville, then south through Spokane and Reeds Spring Junction before heading back east. It was likely followed to avoid the deep valleys that you will see between Hwy EE and Branson. 187.6 miles--The entrance to the residential community of Saddlebrook is on your left. This was a community built to take advantage of the beautiful Ozarks with creeks, trails, fishing, canoeing and all with the convenience of a modern city. 192.1 miles--On your left is the entrance road to Bonniebrook. Bonniebrook is the homestead of Rose O'Neill who was an illustrator and creator of the Kewpie characters. This is a gorgeous piece of property nestled in the Ozark hills where you can see the homestead, museum and gift shop. You're here. Your KC to Branson road-trip is nearly complete. From this point on are the various exits and junctions that will take you to your Branson lodging and the rest of your Branson vacation. 196.1 miles--Hwy 465 exit. If your Branson Lodging is in the Silver Dollar City area or the Branson West/Kimberling City area this would be the quickest route. 199.1 miles--Branson Hills Parkway exit. Hampton Inn Suites and the Payne Stewart Golf Club is at this exit along with lots of shopping. WalMart, Target and Home depot are at this exit. 199.9 miles--Hwy 248 exit. Turning right (west) off the exit is Hwy 248, also known as Shepherd of the Hills Expressway or the Red Route. This will take you to the hotels, theaters and restaurants along Gretna Road, Shepherd of the Hills Expressway, Expressway Lane, Hwy 248 and the western section of Hwy 76. To the left (east) the road is known as Hwy 65 Business, Veterans Blvd and Branson Landing Blvd. 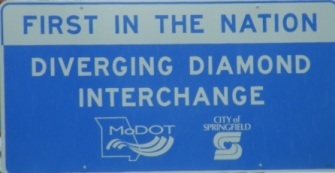 This is another diverging diamond like you went through in Springfield. The road will take you to the downtown and Branson Landing area. 201.2 miles--Hwy 76 exit. Just after going underneath hwy 76, the exit curves back to Hwy 76 where you can go east to downtown or west to the 76 strip. 209.8 miles--Hwy 86 Jct. 86 will take you to the Big Cedar Lodge as well as resorts along the eastern and southern shores of Table Rock Lake. Hwy 86 will take you all the way to Hwy 13 and beyond.